The tour allows us to experience the nature, culture, architecture, rural life and history of Cuc Phuong National Park, Phong Nha Caves, Ke Bang National Park, Hue, Hoi An. Arriving in Hanoi, you will be met by Viet at the Noi Bai airport and then you are transferred to your hotel. The rest of day you will be free to rest and wash up. In the evening, I will take you to watch the famous Water Puppet Show, with its introduction to Vietnamese history and mythology. You stay overnight in Hanoi. After breakfast, we will start our city tour of Hanoi. At first, we go to visit Ho Chi Minh Mausoleum. After that we head to the unique One Pillar Pagoda which date from one thousand year ago. Continue to visit Temple of Literature, the first university of Vietnam, founded in 1070. The highlight of this cultural, historical site is the garden of 82 stelae bearing names, places of birth and achievements of men who received doctorates in each triennial examination from 1442, each stelae sits on a stone tortoise. We have our lunch at the local restaurant before heading to the Old Quarter for a relaxing cyclo tour through the ancient part of Hanoi. After our cyclo tour we will drive to the Museum of Ethnology, which is quite far from the Hanoi centre. It features a fascinating collection of art and everyday objects gathered from Vietnam and its diverse tribal people. We return to the hotel in the late afternoon for staying overnight here. Day3: Ha Noi – Cuc Phuong National Park – Khanh Village. We leave Hanoi for Cuc Phuong National Park which is about 130km from Hanoi to the South. We arrive at National Park at noon, after having lunch at the local restaurant we have a short walk to the National Park to visit the Animal Rescue Centre. After that we head out for walking about 12km along the trail of National Park where you can study about the rich of flora and fauna here, keep climbing downhill to a peaceful valley and reach the village of Khanh, home to Muong tribe. We will have dinner and spend our night with the local family. Day4: Khanh village – Pu luong Nature Reserve. After breakfast we say goodbye to the hosts and drive to Pu Luong Nature Reserve which is about 60km from Khanh Village and inhabited by Thai tribe. After an hour driving, we start to walk about 12km through splendid rice terraced fields, pass several idyllic villages, verdant hillocks, lush farmlands and beautiful mountains. Finally, we arrive at Hang village, home to Thai tribe originally from southern China and ethnically linked to the Thai in Thailand. We enjoy the warm hospitality over a dinner with with the host and an overnight stay in a traditional stilt house. Day5: Pu Luong – Phong Nha Cave, Ke Bang National Park. Today, we drive about 370km from Pu luong to Ke Bang National Park along the Ho Chi Minh trail. We arrive in Phong Nha, Ke Bang National Park in the late afternoon. You can choose to sleep at the home stay or hotel on your request. Day6: Phong Nha, Ke Bang discovery – Dong Hoi Town. We start our tour around 9:30 am by taking a boat trip along the Son River to visit the beautiful Phong Nha cave. We return to the boat station to keep driving about 30km more to Dong Hoi town which locates nearby Nhat Le beach. Check in at Sun Spa Resort for relaxing and then you can go to swim or walk to the nice local market to understand more about the fishermen life here. Day7: Dong Hoi – Hue. After breakfast at the hotel, we drive to Hue which is about 145km from Dong Hoi. Along the way we will go to visit the underground Vinh Moc tunnel, one of the most famous sites of the Vietnam War and Khe Sanh combat. We arrive in Hue after 3 hours driving via Quang Tri Citadel. After getting your hotel, you have an hour for relaxing before being transferred Dong Ba Market where you are free to take photos, shopping as well as explore the local people life. We come back the hotel for showering and dinner before being driven to Perfume River to get private boat for watching amazing Hue Royal Court Music which is listed by UNESCO. After that we are transferred to the hotel for staying overnight. After breakfast, we enjoy the boat trip along the Perfume River. En route we go to visit the Pagoda of Thien Mu, one of the best-known Buddist sites in the city, Tomb of Minh Mang and Tu Duc. And then we return to the hotel for lunch before cycling to visit Forbidden Citadel and around Hue city. We stay overnight in Hue for another night. Day9: Hue – My Son – Hoi An. After our breakfast we head south through coastal rice paddies and traverse the spectacular Hai Van Pass to Hoi An. En route we stop at My Son Temple, the very former capital of the ancient Cham civilization that ruled central Vietnam between the second century and thirteenth century. We arrive in Hoi an around 3 pm, check in the hotel and relaxing. In the morning, we enjoy a cycling ride to the ancient town and then walk to visit the local temples and traditional houses which are charming and wonderful preserved, combining Chinese, Japanese, European influences. This is followed by a boat trip on the Thu Bon River to see how the local people fishing by using the simple equipments and then we keep moving forward to the sea gate to enjoy the amazing view. 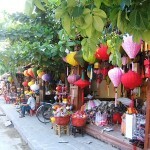 On the way back to Hoi An ancient town, we will go to see some floating villages to have experience of the local life. You stay overnight in Hoi An town of one more night. Day11: Hoi An – Hanoi or Sai Gon. After our breakfast, we explore the cooking class with herb and vegetable garden, learning some well-known dishes of Vietnam and Hoi an, which is the mix of Vietnam and Chinese cruise. And after lunch, we leave Hoi An for Da Nang International Airport to fly back Hanoi or Sai Gon on your request.